Home Lent 2015 Easter – He is Risen! Now on the first day of the week Mary Mag′dalene came to the tomb early, while it was still dark, and saw that the stone had been taken away from the tomb. So she ran, and went to Simon Peter and the other disciple, the one whom Jesus loved, and said to them, “They have taken the Lord out of the tomb, and we do not know where they have laid him.” Peter then came out with the other disciple, and they went toward the tomb. They both ran, but the other disciple outran Peter and reached the tomb first; and stooping to look in, he saw the linen cloths lying there, but he did not go in. 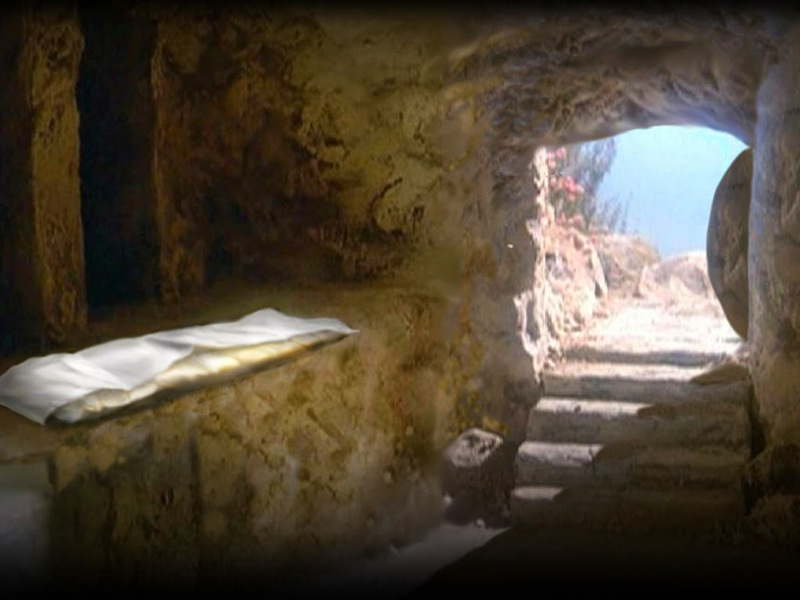 Then Simon Peter came, following him, and went into the tomb; he saw the linen cloths lying, and the napkin, which had been on his head, not lying with the linen cloths but rolled up in a place by itself. Then the other disciple, who reached the tomb first, also went in, and he saw and believed; for as yet they did not know the scripture, that he must rise from the dead. We have made it! From Ash Wednesday, to our Savior’s death upon the Cross, to His glorious Resurrection! He has overcome death and sin, so that we will no longer die in our sin, but may have eternal life. Whenever Jesus would speak of His death, He always joined it with His resurrection, yet the disciples were still sad, fearful and hidden. They witnessed so many miracles, and even witnessed Lazarus being raised from the dead, yet they couldn’t understand who would have taken the Body of Jesus. It may seem so unbelievable to us that Jesus is still alive 2,000 years after His death, but He is here – body and soul. Amen! John was with the other disciples and probably explained to them all that had happened. Peter left his hiding place and ran with John to the tomb and even though John made it first, he allowed Peter, his elder, to enter first. Once inside, they saw how the burial cloths were folded and rolled up, and they believed. It took evidence of the empty tomb for the disciples to understand all that Jesus had told them. Lazarus came out of the grave with his grave-clothes on because He was to die again, but Jesus no longer needed grave-clothes because He overcame death. He was not a ghost, or heavenly being, but raised Body and Soul and robed in glorious heavenly robes fit for the King of kings. We will all still go through death as payment for sin, but Jesus shows us there will be a life when we too will be joined body and soul and robed in heavenly garments as long as we keep our eyes uplifted and focused on Him upon the Cross. Proclaim it from the mountaintops, He Lives! Live in the joy that Jesus Christ has come and defeated Satan, and we have our way to eternal life. Glory and Praise to you, Lord. I am sorry for the times that I have believed as your apostles did not believe, yet You still completed Your Passion and covered my sin with your Body and Blood. Thank you for continuing to give of yourself in the Blessed Eucharist and Blood. Fill me with your Spirit and allow me to always share in the glory and joy of your Resurrection. Hallelujah! Hallelujah!